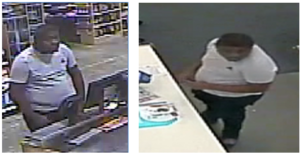 The Palm Beach County Sheriff’s Office needs the public’s assistance identifying a suspect wanted for using a stolen credit card to purchase gift cards. This unknown male entered Publix and Walgreens at Forest Hill Blvd and Jog Road and between both places purchased over $ 500 worth of gift cards. ← The Palm Beach County Sheriff’s Office needs the public’s assistance identifying these suspect who stole the victim’s purse then used her stolen credit cards.